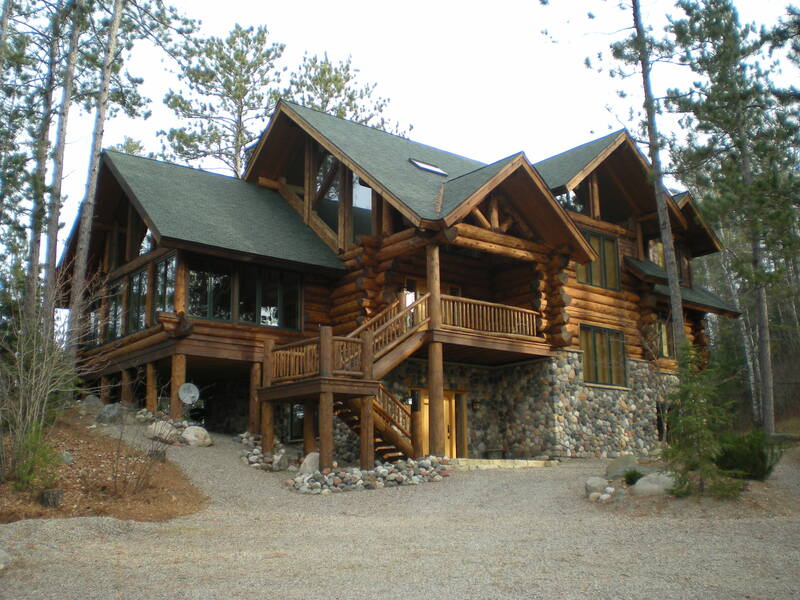 This is a large log home project that we built back in the 1990s made of Western Red Cedar Logs. It has a foot print of about 2400 square feet and two and a half levels. The homeowners and I designed this one together starting with simple scratchings on note pads. At that time I was using a very crude early CAD program called Turbocad. (I have recently moved over to Chief Architect), and I did all the plans and construction drawings for the project myself. We did the log-work on site with this one, unlike many of the other log homes we have built over the years where we carve, fit and assemble the logs off site and then take them apart and reassemble on site. The roof system is interesting, real log structural beams and trusses throughout topped off with 2” ceiling decking and ridged foam insulation, air space for venting and then the sheathing and roofing. It was one of our first projects to do a built up roof like that and it worked well, we have never had any ice dams in the valleys or any build up anywhere on the roof. This was before the thin real rock veneers were commonly available and the stone on the foundation is real rock, about 6” thick. The fireplaces are real masonry fireplaces with the same stone. There are three fireplaces, they are huge, 48” square openings with a traditional Rumford design. Cabinets are pine, built on site, with granite counter tops. All the interior doors were built on site as well. This project features one of my earlier custom entry doors. Because of the double entry, one over the other, there were two identical entry doors. They are made of Alaskan yellow cedar, which is unlike the Western red Cedar in that it is a harder and tighter grain more suitable for working and carving.